This edition of National Radio News announces the Federal Communications Commission's (FCC) approval of the first 15 FM broadcast licenses for stations spread across the country. 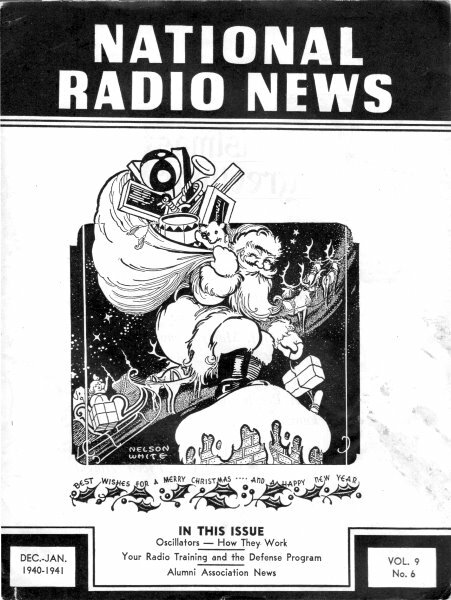 It is also the first issue following America's entrance into WWII and includes a question from a Ham regarding whether simply listening to radio reports was allowed. As you might know, the FCC prohibited amateur radio operators from transmitting for any reason during both World War I and World War II. The reasons given were clearing the airwaves to make monitoring easier, to prevent intentionally encoded messages from being sent, and to keep homeland status information from being broadcast. Homeland status could be ascertained by assimilating reports of who was being drafted and entering service and from where, who was working at manufacturing plants - where and what they worked on, what types of material recycling was happening and where, etc. This article was released to National Radio News by the Federal Communications Commission, Washington, D. C.
A New Jersey amateur inquires if it is permissible to (1) listen in to short wave transmission from foreign stations and (2) if he can still exchange post cards with "ham" operators in Europe. The Federal Communications Commission advises that though amateurs in the United States are now prohibited from exchanging radio communications with such radio stations abroad, there is no regulation against listening to foreign broadcasts, or communicating with persons overseas by mail, telephone, telegraph or cable. From Buffalo comes request for the "answers" to the questions contained in the Commission's "Study Guide and Reference Material for Commercial Radio Operators." Such answers are not furnished. The questions contained in this pamphlet, as well as in the Commission's "Study Guide and Reference Material for Amateur Radio Operator License Examination," are purposely paraphrased to cover the scope of examinations without giving actual examination questions. In either case, the operator should qualify himself to know the answers. A North Carolina resident asks if he would have to get permission from the Federal Communications Commission to build a private telephone line to connect with a local telephone system. He is informed that such intrastate matters come within the jurisdiction. of State public utility commissioners and, accordingly, is referred to the one for North Carolina. The Commission informs several inquirers that there are some 270 pending applications for additional facilities in the present standard broadcast band, of which number 56 are for construction permits for new stations. The Federal Communications Commission has had to censure, by mail, a Pacific Coast ship captain who, in radio discussion with another vessel about position and weather, could not refrain from cussing the latter. His unlawful superfluous language was heard by others and reported to the Commission. A Long Islander is interested in the possibility of a three-way communication system between a vessel, a land station, and an automobile. Except for emergency service involving the safety of life and property, the Commission has not recognized the operation of any type of land station for the purpose of communicating with portable or movable equipment of organizations of individuals. There is no specific amount of time which radio stations are required to devote to public and educational agencies, the Commission advises a Philadelphia body. Licenses are issued on general determination that the stations will serve the public interest, convenience and necessity. It is up to the broadcasters to include programs of an educational, religious and civic nature, but the amount of time devoted to these subjects rests between the stations and the groups concerned. The final "Go" signal for FM (frequency modulation) was given by the Federal Communications Commission in authorizing 15 applicants geographically scattered throughout the nation to engage in this new type of broadcast on a commercial basis as soon as they are able to do so. Baton Rouge - The Baton Rouge Broadcasting Co.
Milwaukee - The Journal Co.
New York City - National Broadcasting Co.
Evansville, Ind - Evansville On the Air, Inc.
Binghampton, N. Y. - Howitt-Wood Radio Co., Inc.
Brooklyn N. Y. - Frequency Broadcasting Corp.
Columbus, Ohio - W B N S, Inc.
Schenectady, N. Y. - Capitol Broadcasting Co., Inc. Giving these stations the starting gun is the last formality in a series of actions by the Commission to make possible, for the first time in radio history, the use of the high frequencies for commercial broadcast. Three particular advantages are claimed for FM, namely, that it gives more tone range, is static free, and more stations can use the same channel without interference. The last-mentioned asset opens up a new field for broadcasting, which has long clogged the present standard broadcast band.